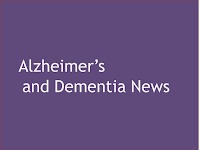 Mental deterioration occurs more quickly in women with Alzheimer's disease than in men with the devastating brain illness, a new study finds. Bob DeMarco spent more than eight years taking care of his mother, who had Alzheimer's disease before she passed away at age 95 in May 2012. During this eight-year period, his chief concern as a caregiver was for his mother. But sometimes, he says, he would think of his own risk in the future. Early Stage: Debbie and Fred Roedger. Middle Stage: Tammy and Bob Calhoon. Late Stage: Larry and Karen McKelvey. Veteran comedian and entertainer Max Bygraves has passed away. The beloved performer died at his daughter's home last night after suffering from Alzheimer's Disease, his son Anthony confirmed. At his daughter's suggestion, Mr. Cain, of Bedford, Ind., saw a neurologist last year who did an MRI, then a spinal tap. He found that Mr. Cain had a buildup of fluid in the brain called normal pressure hydrocephalus. The fluid was drained with a surgically implanted shunt. Now, 13 years after his symptoms began Mr. Cain, 70, is walking, joking and matching wits with TV's "Jeopardy" again. "It was just like getting my life back," he says.